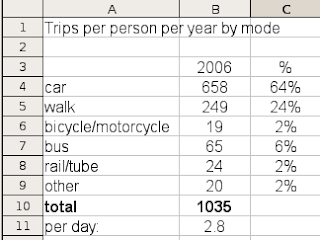 I was recently sent some transport statistics from Britain by someone who works for a government agency in the UK. The first diagram is a plot of modal shared for motorized transport. This originates with the UK Commission For Integrated Transport and purportedly shows that the Netherlands is second only to the UK for car dependence. The problem with this is, of course, that it is a plot only of motorised transport. In the Netherlands 18% of all all journeys are made by foot and 27% by bike. So they are missing out nearly half of the total. It's not even doing the UK any favours. People are often surprised to learn that 24% of journeys in the UK are by foot, though sadly less than 2% are by bike. 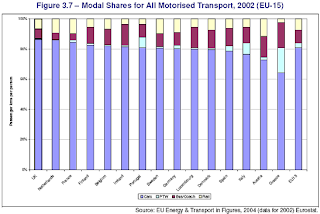 If you estimate figures on this graph and adjust for those non-motorised modes you suddenly find that in the UK around 68% of all journeys are by car, while in the Netherlands it's about 57%, which is a bit closer to the official figures of 64% in the UK (below) and 48% in the Netherlands. A substantial difference from the impression given in the first chart. Funny things, statistics. Draw the right graph and you can "prove" things that are not quite true. Here is another piece of information from the UK showing the current number of trips per person per year by different modes of transport. Bicycle and motor bicycle are combined and between them make up just 2% of the total at 19 trips per year for the average person. In reality, of course, this means many people simply never cycle at all in the UK. Cycling is completely alien to them, and cyclists are considered to be a bit odd - possibly even criminal. This compares with 0.8 trips per person per day by bicycle in the Netherlands, rising in cities with more cycling. It's a little under 1.2 trips per person per day here in Assen and 1.4 per day in Groningen. It makes a very large difference to people's perception of cycling when it's a "normal" thing to do - when they regularly take part in it themselves, when they see all their neighbours cycle regularly, when their children all cycle to school. For cycling to become normal again, it has to cease to resemble an extreme sport and be both very safe and convenient. It has to stop dropping in popularity (the average number of miles covered per person per year in the UK was 43 in 1997, but just 39 by 2006 - a 10% drop in ten years) and start rising. Until this happens, cycling will continue to be vulnerable to threats such as insurance companies blaming cyclists for being hit by cars. I previously covered the number of households who don't have a car in the UK vs. the Netherlands. One thing I can appreciate about Portland, is that, while the national average of vehicle miles traveled per person has been on a steady increase for the last decade and a half, the number of vehicle miles traveled per person in Portland in 2007 was about the same as in 1992. It went up for a couple of years, but has dropped down again. Thankfully, though the roads themselves are designed for cars in most of the city, the inner part of the city is at least laid out in a way that makes it easy to traverse by foot or by bike, so that travel for any of your daily needs usually doesn't exceed a few miles. This also cuts down on vehicle miles traveled. Hopefully by next year we'll be up to 10% or more of people commuting to work by bicycle, and hopefully as Azor, Electra, Flying Pigeon, and the various cargo bikes we see around start to become more available and more visible in Portland, more people will start realizing they can use their bikes for all kinds of things, not just going directly between home and work. PM: The press'll have a field day with me about this. Do we have any statistics on it that I can throw at them to show that we really are doing everything we can? Sir Humphrey: Prime Minister, we are the government; it's our job to collect unbiased statistics. What would you like them to say? The issue of combining bicycle & motorbikes in the statistics has some nasty implications - I got into an almost heated discussion with my mother last night about bikes and motorcycles. Apparently, a motorcycle is classed as a 'bicycle' on it's registration documents in the UK. I kinda think she'd know about this - used to work at a post office counter, issuing vehicle tax documents, and both my parents are active members in a motorbike club. What she says this means is that unless a route specifically excludes them, all cycle routes are fair game for motorbikes. "...the number of vehicle miles traveled per person in Portland in 2007 was about the same as in 1992." I'm curious about how many of those vehicle miles were on bicycles and if the percentage has changed. For example, if 5% of the vehicle miles were on bicycles in 1992 and that has grown to 7%, that would be a positive trend. Is that information available?